(WACO) – Cody Scheffe is building a staircase to gold forged from sawdust and determination. Scheffe, 21, of Windthorst, is a Texas State Technical College in Waco Building Construction Technology student. He made his SkillsUSA debut in April at the State Postsecondary Leadership and Skills Conference, where he claimed gold in carpentry. He will now go on to represent Texas at the SkillsUSA National Leadership and Skills Conference being held June 23-29 in Louisville, Kentucky. “The first I’d heard of SkillsUSA was when I got to TSTC. My instructor, Mr. (Michael) Carrillo, was talking about it, and it sounded like a good opportunity,” Scheffe said. SkillsUSA is a national partnership of students, teachers and industry working together to ensure that America has a skilled workforce. The carpentry competition consists of one student working in an allotted time to frame walls, cut and install rafters, demonstrate knowledge of stair construction and more. Contestants are judged on accuracy, ability to read and interpret blueprints, workmanship, safety, and the proper use of tools, equipment and materials. “I didn’t think I was going to win because I was going against a guy who had competed before and had already gone to nationals. I thought it would be close, but I was pretty surprised,” Scheffe said. 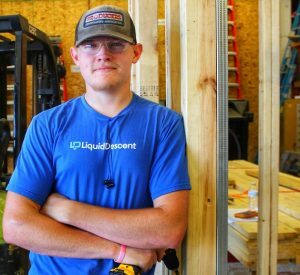 After winning at state, Scheffe’s drive to win at the national level was encouraged as he began training regularly with TSTC Building Construction Technology instructors John Russell and Michael Carrillo. “It’s his first year, he won state, and he’s a third-semester student. That’s really impressive because some of the things that the project is testing him on are on the advanced level and he hasn’t learned yet in the classroom,” Carrillo said. Carrillo also competed in carpentry at SkillsUSA when he was a student, placing fourth at the national level. He pulls from his personal experience to offer guidance. Through SkillsUSA, Scheffe has become aware of numerous prospects made available to him and plans to capitalize on them. Scheffe has earned the respect of his instructors, who were already impressed with his performance in the classroom, while competing at the state level. They have high hopes for him at nationals. Time spent training with his instructors and previous experience working with his father’s company have combined to give Scheffe a sense of confidence when approaching the national level. Scheffe will graduate in spring 2019 with an Associate of Applied Science degree in Building Construction Technology. For more information on SkillsUSA, visit skillsusa.org. Registration for fall classes at TSTC is underway. For more information, visit tstc.edu. This entry was posted in Waco on June 21, 2018 by Daniel Perry.